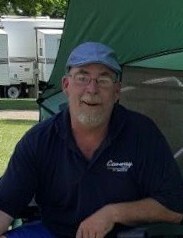 Daniel Lee Bartelson, affectionately known as "Dan," 48, of Barnesville, MN, passed away unexpectedly at his residence on Friday, February 8, 2019. He was born September 25, 1970, in Detroit Lakes, MN, the son of Duane and Mae (Frikken) Bartelson. Dan graduated from Breckenridge High School, Class of 1989. Following graduation, he started his trucking career at the age of 18. Accumulating 28 years of experience between United Van Lines, Mayflower and XPO Logistics (Conway). In 1992, he met the love of his life, Nickie (Culbertson) and were married in 1993, and recently celebrated 25 years of marriage. From this union, they are blessed with two children, Amanda (Derek) and Dallas (Jordan). The family moved to Barnesville in 1998. Dan was a devoted father and proud grandfather to Gavin, Jett, Ava, and Farah. He especially enjoyed spending his time with family and friends. He also loved to camp, play poker, darts, deer hunt, and was an avid Denver Broncos fan. An annual trip to Louisiana to visit friends was looked forward to every year. One of Dan’s greatest accomplishments was competing in the state level truck driving competition for eight years, placing 1st several of those years. In 2017, he achieved 4th place at the national level for the Truck Driving Championship. Dan was preceded in death by his mother, Mae, and special dog, Sambo. Surviving in addition to his wife, Nickie, are his father, Duane (Kathy), his grandmother-in-law, Jeanette Longtine, his in-laws Herbert (Constance), Shelly (Mark), his daughter, Amanda (Derek), and son, Dallas (Jordan). Four grandchildren, Gavin, Jett, Ava, and Farah. Siblings include Duane “Sonny” (Pat), Tami (Darrell), Drew (Katie), Trudi (Dean), Toni (Brian), Dave, Derik (Brittany), Doug, brothers-in-law, Josh (Jen) and Eric and numerous nieces, nephews, extended family, and dear friends. A celebration of life in honor of Dan will be held with a congregation of fellowship starting at 1 pm, followed by a service at 3 pm, Saturday, February 16, 2019, at Vertin Munson Funeral Home, 224 6th St N, Wahpeton, ND. Arrangments have been entrusted to Joseph Vertin and Sons Funeral Home, Breckenridge. Obit submitted by Dan’s loving family.